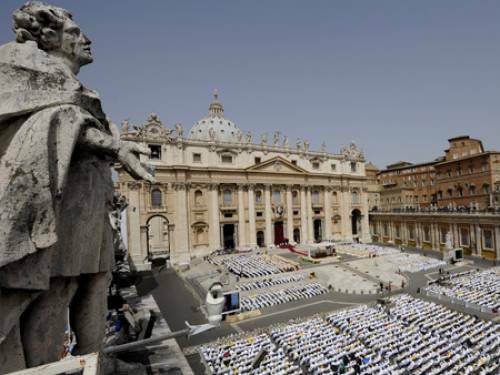 Half a millennium ago, the Holy See established secret archives that today house millions of documents, including private papal records, La Stampa's Marco Mavaldi reports. Half a millennium ago, the Holy See established secret archives that today house millions of documents, including private papal records, meant to be protected both from the elements, and prying eyes. It is also a great resource for historians. Once I realized that I was not in the labyrinth of “The Name of the Rose,” but in a place much like the library of the Physics department of the university where I'd spent many a frustrating afternoon, my excitement was downgraded to simple curiosity. The very polite and expert archivist added to that feeling when he told me precisely where we were. The Vatican Secret Archives were founded exactly 500 years ago, in 1612 -- with Baldassarre Ansidei as its first archivist -- to guard documents which had been worn away by microorganisms and mold in the previous archives in Castel Sant’Angelo. But given that names are important, let’s start with the word “secret.” It comes from the Latin “secretum”: that is secluded, and private. The archivist explained that the translation “secret” was not totally accurate. In fact, the archives are dedicated to the Pope’s private business. Mainly, it consists of correspondence containing pleas and petitions for benefices and prebends. There are also administrative documents, such as the verdicts of the Catholic appellate tribunal, the Sacred Roman Rota, and many others. The archives’ bookshelves take up over 85 kilometers in the Vatican undergrounds, and we can roughly estimate that there are several dozen million documents, of varying importance. The archives have to keep everything, and so here you can find just about anything. I’ve only been able to capture a few details of this huge collection, some of which were curious, some mysterious, some useless. There are receipts of payments from Cardinal Borghese to the artists under his wing; incomes from papal assets; the Liber Diurnus (a ninth century set of rules on how to write official letters to the Pope or the emperor); special petitions addressed to the Pope by various powerful people of the world. The history of the archives is often connected to the history of attempted French power grabs. For example, the documents of the older archives (Archivium Archis), were moved from Castel Sant’Angelo to the Vatican museums overnight, to avoid ending up in French hands. In the end however, the French took over the archives and Napoleon ordered the documents to be transferred to Paris. It was just a brief sojourn, though. In 1814, after the first defeat and exile of the Emperor, the volumes went back home. Some documents were lost (approximately one fourth, according to some estimates) and others were kept by the French, because of their historical importance. Among these, were the documents of the Galileo Galilei trial, which they agreed to return 30 years later. At first glance, the word “secret” seems like an overstatement. But if a very curious person was to ask which documents they were allowed access to, there would be some surprises. Indeed, not everything can be consulted. Every Pope sets the date after which the archive can be seen. Currently, for example, Benedict XVI has forbidden the access to documents dating before 1939. It is a step up from John Paul II’s 1922 threshold. John Paul II also established the “Cura Vigilantissima,” a series of rules forbidding the consultation or disclosure of documents concerning a Pope’s private life, or documents about canon trials. The archivist was vague on the subject, though. Still, even without these particular documents, the archives offer some gems. The last document that the archivist showed me was a letter addressed by famed Italian patriot Giuseppe Garibaldi to the papal nuncio on October 12, 1847. At the time, Pope Pius IX was seen as a hope for the future unification of Italy, and Garibaldi wrote to him offering his and his comrades’ arms to defend the country and Rome from foreign invaders. Later, Pius IX revised his liberal positions, which caused Garibaldi to call him “a cubic meter of muck on the other side of the Tiber River.” This happened 22 years after the first letter, a lifetime in politics, but only a droplet in Vatican history. The Vatican kicked off a sixmonth exhibit at Rome’s Capitoline Museum yesterday that will place 100 documents, usually locked away in the Pope’s personal archive, on display.